Dodgeville began soon after the coming of miners and prospectors in 1827. Most notable was Col Henry Dodge, who came with his family and four black slaves on October 3, 1827. Dodge made friends with the Winnebagos and gave them several hundred dollars’ worth of provisions and merchandise in exchange for rights to mine on their land. By January, Dodge’s party had mined more than $3000 worth of lead. Others heard about Dodge’s success and came to mine on Indian land, most without buying the right to do so. Winnebago Chief Carumna complained to the Indian agent at Prairie du Chien, who ordered the miners off the Indian land. But he found about 130 miners, armed with rifles and pistols. Since there were only 130 men fit for duty at Fort Crawford, the U.S. government decided instead to negotiate to buy land from the Indians. Dodge was a signer of the 1829 treaty. He later became the first territorial governor, a Congressman, and a U.S. Senator. The railroad brought the traveling circus to Dodgeville, and also provided honeymoon trips for many young couples. Irish, Welsh, Norwegians and Germans settled in the Ridgeway area in the 1840’s and 1850’s. Ridgeway has the only railroad depot left along the Military Ridge Trail. The depot was built in September 1913 from the middle-sized of three standard wood-frame depot plans commissioned by the Chicago and North Western around 1900. Similar stations were built in Wyeville, South Beaver Dam, Grand Marsh, Sussex, Mercer, and Bellevue, Wisconsin, as well as communities in Iowa and Illinois. The Ridge Hotel dates to 1841, when it was a stage stop on the Military Road. The village switchboard was there until dial phones came through. The 23-room hotel is now a private residence. 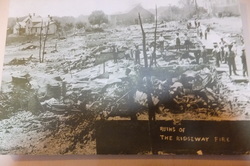 On May 1, 1913, a disastrous fire consumed the majority of the Ridgeway downtown. The fire started about 2:00 p.m. on the south side of Main Street. High wind accelerated the fire to the north side as well. A bank, the Post Office, lumberyard and other businesses, and the 1883 railroad depot were all destroyed by the fire. Railroad passenger service was delayed for two hours that day due to the intense heat of the fire. One of four front-page fire photographs in the May 9, 1913, Dodgeville Sun-Republic was of several railroad freight cars silhouetted behind the smoking remains of the Chicago and North Western depot. According to the newspaper, the depot agent secured a desk and chair, set a telegraph line to a vacant boxcar, and was back in business. The estimated value of the building was $2,000, and its contents valued at $1,000. The total property loss to the village of Ridgeway was between $90,000 and $100,000. The Ridgeway Depot was sold to a local business in 1976. The Friends of the Military Ridge Trail purchased the Ridgeway Depot in 2001, with the purpose of restoring it. This depot is the last remaining depot on the Military Ridge Trail. All other depots have succumbed to decay or have been torn down. The Ridgeway Depot is also a museum of railroad artifacts and history. It allows users of the trail and visitors to the area to experience what it must have been like to wait for the train to arrive. The train brought relatives to visit Ridgeway and the surrounding area and took their sons off to war. The Depot helps visitors learn about the history of the railroad in Southwestern Wisconsin and understand its importance to the development and prosperity of the area. Funding for the restoration of the Ridgeway Depot was provided by funds raised by the Friends of the Military Ridge Trail, community supporters and the Wisconsin Department of Transportation. The Friends of the Military Ridge State Trail commissioned a mural to be painted inside the historic Ridgeway Depot. This exhibit opened on September 2, 2007. Along with the striking mural are pictures of the depots that once stood along the line, as well as other photographs and recollections from neighboring historical societies and people who lived along the railroad line. This project was funded, in part, by a grant from the Wisconsin Humanities Council, with funds from the National Endowment for the Humanities, State of Wisconsin, and the Boldt Company. The Wisconsin Humanities Council supports public programs that engage the people of Wisconsin in the exploration of human cultures, ideas, and values.